The task-oriented two-page spreads get you up and running fast. 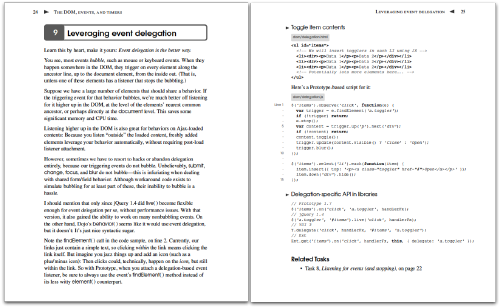 The left pages explain the underlying implementation for each task, and the right pages contain code snippets for that task, along with cross-references to related tasks. Use this Pragmatic Guide to get started creating your own killer web applications, quickly and professionally. Christophe Porteneuve has been doing IT R&D for more than 10 years, specializing early in Web development. He joined Prototype Core in 2006, wrote Prototype and script.aculo.us in 2007, and sometimes speaks at conferences such as The Ajax Experience. He’s the CTO of Ciblo.net in Paris, France, where he lives with his wife, Elodie.